Fabricators slitting continuous lengths of coiled sheetmetal to size strive to improve the efficiency of their scrap-handling operations related to edge trim. Scrap winders, for instance, expose operators to sharp, fast-moving edge trim, while requiring frequent handling and monitoring, plus production-line stoppage to change out heavy, awkward scrap balls. Manual handling of such scrap can be even more labor intensive and potentially hazardous. A safer, more efficient to handle slitter-line trim: scrap choppers at the point of generation, as evidenced by Precoat Metals at its site in Birmingham, AL. Precoat Metals supplies coating services for coils of flat-rolled stock, and employs scrap choppers to handle slitter-line edge trim safely, while improving safety, productivity and scrap value. Before investing in new scrap choppers, the scrap winder at the Precoat Metals’ Birmingham plant created a bottleneck at its high-volume slitter-line operation. Not only did the operator have to manually thread the edge-trim scrap into the winder at the start of every coil processed, but also each time the scrap thread would break. This caused production downtime to rethread the edge trim into the scrap winder. waste edge trim on the fly. Coordinated by a frequency drive that makes automatic adjustments, a stand accommodates material width while the chopper and conveyor match slitter-line speed. Chopped scrap dumps directly into a storage hopper inside the building, sparing the operator a 10-min. trip outside several times per day. Previously, an operator had to deposit bulky scrap balls in a 40-ft. container outside. And, because the chopped scrap is more highly valued than unprocessed scrap, scrap dealers pay more for it. “We’re getting an extra $10 per ton for our scrap,” says Fleischmann. “The extra income, more than $10,000 per year, is an untapped resource that’s going straight to our bottom line.” Also, according to Fleischmann, the plant saves about 200 hr. of labor per year thanks to its new scrap choppers. Another scrap-chopper success story comes from the Portland, OR, facility of ne-Dalton Corp. 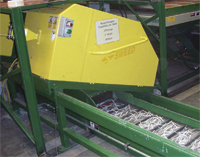 The garage-door manufacturer installed Sweed scrap choppers on its coil-processing lines to eliminate the need for operators to manually fold edge-trim scrap and toss it in a hopper. Changing coils and setup also was necessary when running narrow doors on the slitter line. Mike Pfeiffer, a ne-Dalton supervisor, estimates saving at least 100 hours of labor per year in scrap handling. The system also enables a single coil size to be used for standard and narrower doors, eliminating the cost of keeping an extra coil size in inventory. See also: Sweed Machinery Inc.